Primary and secondary character design will be a iterative process once we get access to the Dreams sculpting tools, the following images serve an inspirational reference point for the design aesthetic we're striving for. It is expected that once we commence construction these designs will evolve greatly to better suit the narrative and environment. 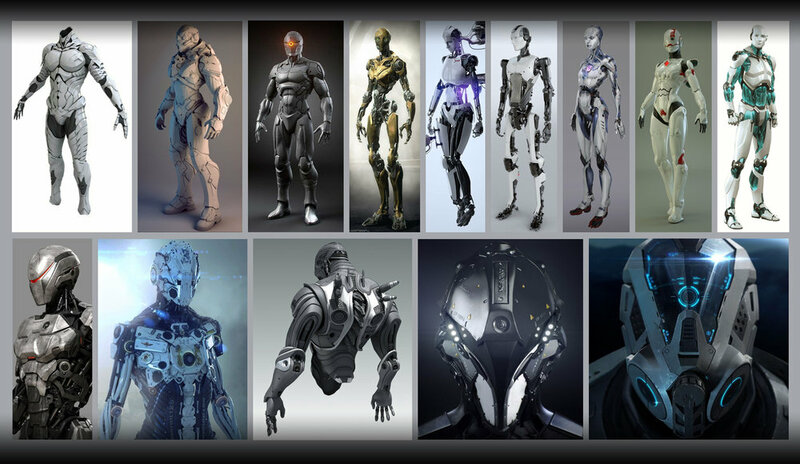 While reviewing hundreds of possible android designs for Europa Descents main android character we stumbled across ESET by Puppetworks (linked below) This design embodies everything we were looking for (save a few tweaks, removal of face, additional back and arm detail etc) clean white/minimalistic look with some internal structure exposed. Once Dreams enters Beta and we have access to the modelling tools we will publish images and videos of the iterative design process showing how this character evolves. The player will be assisted( ...and hindered) by multiple scientific drones throughout his journey, as with primary character inspiration research we reviewed hundreds of drone designs before stumbling across the following concept sketches by digital artist Yury Krylou. The clean minimalistic design aesthetic matches that of the primary character and much like the primary character once we get hands on time with Dreams sculpting tools these designs will evolve further. On activation these power-ups provide a wide range of attribute boosts (example: Run-Speed, Jump Height, Strength). To reduce UI clutter all boosts will be presented to the player through physical model changes, hue shifts and audio queues. Players will be able to discover power-ups in a wide range of locations throughout their journey, some will be in plain sight, others will require exploration and the combination of previously activated power-ups to access. We will endeavour where possible to maintain a unified colour scheme to make the identification of each power-up familiar to the player. For example on the surface the run-speed boost is identified by a green glow applied to your feet, subsurface submarine speed boosts will be identified by a green glow to the engine/thrusters. 1) Surface = Mechanical debris, both from your crashed lander and previous landers that have landed on Europa. 2) Subsurface = Harvested from flora and fauna. Players will also encounter Alien artefacts and structures that can provide limited duration attribute boosts as well as permeant upgrades. 3) Mega Structure = Interfacing with terminals and equipment players can absorb attribute boosts.